I began my shiatsu journey in 1989 at the Glasgow School of Shiatsu. Following a post graduate at the Shiatsu College of Norwich, I have been fortunate to study advanced techniques with many inspiring and internationally respected teachers, most notably Clifford Andrews and Pauline Sasaki. Since 1996 I have been a permanent member of the teaching team at the Glasgow School of Shiatsu. Here, and at other UK shiatsu schools, I have taught on all levels of the 3year diploma course and organised a variety of workshops. I have also worked in many different clinics and settings in Glasgow including Health Board initiatives. Reiki training began in 1990 and in 2008 I became a master. Reiki enhances my shiatsu work and connection to the body’s energy. It continues to be a powerful form of healing and strengthening, both to give and to receive! A regular practice of Mindfulness meditation, yoga and many years of Qi Gong are inspiring influences, and I have also trained in Chinese Food Therapy. Becoming interested in the internal restrictions we impose on ourselves, that settle in our subconscious, my work has been influenced by the teaching of FM Alexander and my training in EFT (Emotional Freedom Technique). Relieving the grip of unhelpful, buried ideas allows the energy system to be free and at ease, flowing clearly and strongly again. 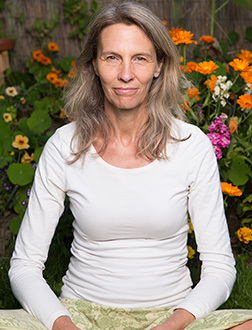 I am a practitioner and teacher member of the register of the Shiatsu Society UK, our regulatory body whose standards serve as benchmarks for European shiatsu practice. 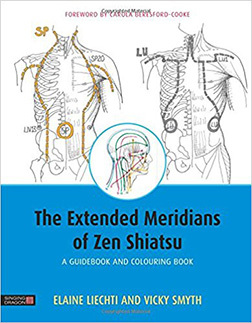 In 2016 the diagrams I produced for teaching were finally published as a text book, A Guidebook to the Extended meridians of Zen Shiatsu, which has sold worldwide.